Andromeda is a development board powered by Atmega2560, a feature rich microcontroller from Atmel, having 256KB of in-system self-programmable Flash and 8KB of SRAM. With a set of instructions that execute in a single clock cycle, the microcontroller can achieve throughput of 1MIPS per MHz. The board is ideal for embedded applications where balance of power consumption and processing speed is required. Andromeda requires 5V power supply. The open auxiliary ports provided on Andromeda makes it suitable for any embedded application. It has a 3.3V regulator and a reverse power protection circuit. A CAN controller interface is also provided on Andromeda. Andromeda has a 32KB CMOS static RAM, fabricated using ISSI’s high performance, low power CMOS technology. A unique feature of Andromeda is Phi Robotics Expansion Bus. Phi Robotics Expansion Bus is a cross-platform stackable connector which allows user to build modular systems. Multiple expansion boards can be stacked on top of a base board to expand the system functionality. All the signals on the expansion bus are standardised to 3.3V. Base board expansion bus have 3.3.V and 5V supply lines to power expansion boards. 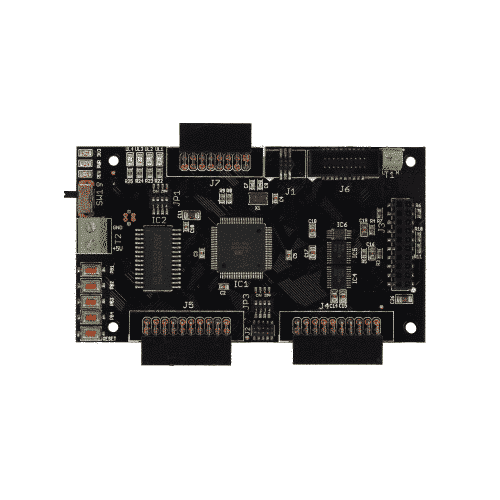 All Phi Robotics base boards and expansion boards comply with this expansion bus design. Phi Robotics Expansion Bus is a 10x2 pin connector having the following peripherals: UART, SPI, I2C, CAN, GPIO and external interrupts. All expansion bus peripherals are enabled on base boards, however on expansion boards only peripherals that are required are enabled.